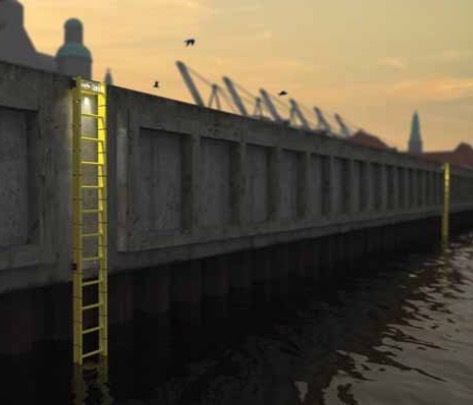 The reputable international maritime consultant and supplier’s representative, ECKS MARINE, based in Hamburg will be German marketing and sales agency for LifeLadder, a new rescue ladder designed to increase safety in harbours. “I am confident that in a few years’ time the LifeLadder will be the preferred choice in most German ports whenever a conven- tional ladder has to be replaced as well as for new projects”. “We looked for an experienced partner with a solid network and a passion for safety, and we found what we were looking for in ECKS MARINE. We are very proud of our partnership with Torsten and his team,” says Kim U. Haaning. On the future perspectives for LifeLadder in Germany, Torstens Ecks says: “LifeLadder lifts up the safety standard of a port or terminal dramatically. Due to its bright yellow colour it can easily be seen by people in the water, and it has the option to be illuminated at night. In addition the LifeLadder requires zero maintenance, i.e. no de-rusting, no painting or welding. In fact the advantages of LifeLadder start even earlier, both in production and during transport LifeLadder saves the environ- ment due to its low carbon footprint. It is so light that you won’t need a crane or a multi-man crew to install it, yet it is very robust. “Even if damaged, the modular design provides the advantage, that the damaged part can easily be replaced. Compared to conventional steel ladders —being galvanized or not — LifeLadder even has a longer lifespan” says Torsten Ecks.